The governing party is currently holding its 5th national policy conference at Nasrec Expo Centre in Johannesburg. Catch all the latest updates from day one of the conference here. President Jacob Zuma admitted Friday the ruling ANC party is beset by corruption and divisions that could threaten its uninterrupted hold on power since the end of apartheid rule. 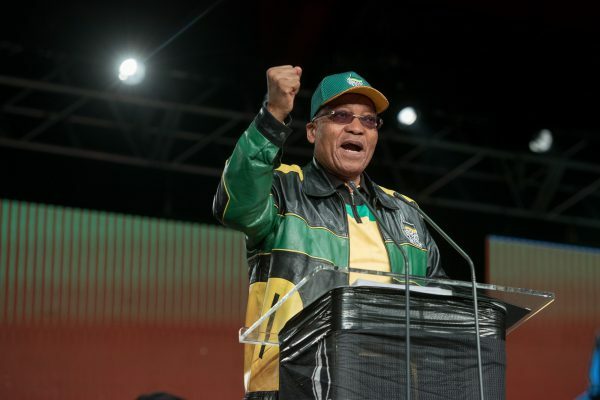 Zuma, who has himself been at the centre of several major corruption scandals, called on the African National Congress (ANC) to reform and turn around its fortunes ahead of elections in 2019. Zuma may stay on as president until the election, but he is due to step down as ANC chief in December and the party faces a bitter internal leadership battle. He said that the ANC needed to “cleanse itself” of “corruption, social distance, factionalism (and) abuse of power”. “Factionalism is a cancer that must be rooted out of the ANC,” he said, opening a six-day policy meeting in Soweto, south of Johannesburg. Critics accuse Zuma, 75, of allowing corruption to flourish since he came to power in 2009, and of being in the sway of the Gupta business family, allegedly granting them lucrative government contracts. The president has been admonished by the country’s highest court, and is fighting a judicial order that could reinstate almost 800 corruption charges against him over an arms deal in the 1990s. “Access to state power and resources has led to perceptions and allegations that the ANC is a corrupt organisation,” Zuma said, vowing to fight against graft. His speech was greeted with only weak applause, though before the event his supporters at the venue sang songs praising him. Zuma is seen as favouring his ex-wife, former African Union chief Nkosazana Dlamini-Zuma, to succeed him — rather than deputy president Cyril Ramaphosa. Dlamini-Zuma sat directly behind the president, in full view of the television cameras, while Ramaphosa was loudly cheered when he arrived on the stage. The clash between the two camps could provoke further political instability in South Africa, which this month slipped into recession and also is suffering record unemployment. Ramaphosa, a wealthy former businessman and trade union leader, has remained largely loyal to Zuma but sharply criticised him after the sacking of the respected finance minister Pravin Gordhan in March. Zuma took a swipe at his critics, saying that “some members and leaders of the ANC have become primary conveyors of negative information about their own movement”. The president admitted that economic growth was lower than expected and that local elections last year had been a “serious setback” for the ANC, when it lost about eight percent of its previous national support. He blamed the fall in support on perceptions that “we are soft on corruption, we are self-serving and that the ANC is arrogant”. Some veterans of the struggle against apartheid rule, which ended in 1994, boycotted the conference, which ends on Wednesday. The opposition Democratic Alliance party made gains in the local elections and hope to benefit from the ANC’s woes in the 2019 vote. President Jacob Zuma on Friday said the 5th national policy conference of the ANC must consider the matter of various forms of ill-discipline, particularly certain “ANC leaders” who make negative public utterances against the governing party, and factionalism. “Factionalism is a cancer that must be rooted out of the ANC. It has caused splits from the ANC which has negatively affected us both quantitatively and qualitatively. Slate politics, another manifestation of factionalism, has cost us many good and capable comrades in whom our movement has invested significantly,” said Zuma. Zuma said “this irresponsible perpetual negative messaging by our own people” has a negative impact on the South African economy. “We need to discuss how we can balance our valued trait of self-criticism with the need to protect the ANC and provide it with the space to resolve problems in a more organized manner,” he said. Zuma also charged delegates at the policy conference to assist the governing party to renew itself by finding ways to cleanse itself from negative elements which have crept in. “To restore and maintain its character, the African National Congress needs to cleanse itself of the negative tendencies which have crept in over the years. These tendencies, which have been outlined before, include patronage, corruption, social distance, factionalism, abuse of power and membership system anomalies such as the reported manipulation of the membership data, gate keeping and bulk buying of membership,” said Zuma. Regarding the dwindling support base of the governing party, Zuma said the ongoing conference must earnestly diagnose the ANC and do honest self-introspection. “Our movement suffered a serious setback in the August 3, 2016 local government elections and experienced a decline of about eight percent of the national vote. Our discussions here will reflect on these elections for lessons to be drawn and solutions to be found. We lost control of some key metropolitan municipalities including Johannesburg, Tshwane and Nelson Mandela Bay,” said Zuma. “In Ekurhuleni we managed to form a coalition to retain control of the council. Zuma said since August 2016, members and supporters of the ANC have – out of pain and genuine concern – been engaged in varying degrees of robust discussions about what has gone wrong with “their beloved movement”, and how the party was outwitted in the metros. “The National Executive Committee meeting in the immediate aftermath of the announcement of the results attributed our loss of support to perceptions in society that we are soft on corruption, we are self-serving and that the ANC is arrogant. These are based on research findings we had undertaken before the elections, which proved to be correct,” said Zuma. The SA National Civic Organisation (Sanco) on Friday said the ANC national policy conference (NPC) was a “watershed make or break moment”. In a statement, the ANC ally said the NPC must be used to forge unity within the party. “Delegates going into the conference carry with them the responsibility to rise above factional interests, put South Africa and our communities first,” said Sanco national spokesman Jabu Mahlangu. Mahlangu said the survival of the party was largely dependendent on cronyism and political elitism being done away with. The policies developed at the NPC should also reflect the ANC’s commitment to eliminate state capture and looting. “Policies to be amended must respond adequately to the rising tide of corruption threatening to erode public confidence in governance institutions,” said Mahlangu. Political education remains paramount for both new and existing members, according to ANC leader Jacob Zuma. He said the renewal of the party also relates to the strengthening of alliance partners and the party leagues. He said policy discussions must reflect on the relationship between alliance partners. “The unity of the alliance is sacrosanct and must be protected at all times. The role of women in the ANC and society must also be discussed,” Zuma said. The ANC’s alliance partners Cosatu and the SACP have both called for Zuma to step down from office. He is currently presenting the opening address at the party’s 5th national policy conference in Nasrec, Johannesburg. Zuma called for strong veterans and MK leagues to provide a platform for them to participate in the work of the ANC, saying the ruling party also needs to adapt to the needs of young people. Why do people now communicate with us through protest? Zuma asked on Friday morning. He said ANC members must not be emotional about what caused the party’s electoral support to decline. Several parts of the country have in recent months been gripped by violent protests, but Zuma believes there is no need for people to become violent. “The ANC has referred to social restlessness which manifests itself to community protests. We don’t condone violent protests as people can make their voices heard in a peaceful manner,” he said. Zuma said there is no need for protests to become violent, and damage to property incidents must be treated as serious crimes. Don’t just end by diagnosing the problems but develop solutions too, was the message from ANC president Jacob Zuma. “Ahead of the discussions we need to remind ourselves of the objectives and the missions of the ANC,” Zuma said during his opening address of the party’s policy conference on Friday morning. He said the ANC remains committed to uniting South Africans. Zuma called for mutual respect during the conference and said despite the challenges faced by the governing party, the ANC remains an organisation of hope for many people. He said the ANC need to cleanse itself from the negative tendencies. “These tendencies include patronage, abuse of power and bulk buying of membership. Factionalism is a cancer that must be rooted out of the ANC which caused splits in the ANC…Slate politics is another manifestation of factionalism,” he said. Zuma said ill-discipline such as public utterances is something that needs to be looked at. He said some members and leaders of the ANC have become primary conveyors of negative information of their own movement. “These negative messaging by our own people has a negative effect on our economy. We need to be able to differentiate between self-criticisms and the furtherance of certain agendas….our movement suffered a serious setback in the 2016 local government elections,” he said. Still on the municipal elections, Zuma said lessons will have to be drawn and solutions to be found after the ANC lost power in Tshwane, Johannesburg and Nelson Mandela Bay metros. He said the ANC will have to regain that lost ground. Unity must be the thread that keeps the ANC and South Africa together, President Zuma said on Friday. Delivering the opening address at the party’s 5th national policy conference, Zuma said our deliberations at the conference will have to look at what needs to be done to reignite the economy over the next five years. He also spoke about how the ANC promotes freedom in the country. Commenting on the ANC government and its work on improving the lives of the poor, Zuma mentioned water, electricity and other basic services that the ANC has achieved in delivering the communities. “The ANC has also succeeded in creating economic opportunities for black people who were previously excluded. These opportunities need to be broadened to reach more people over the next five years,” Zuma said. He stressed much more still needs to be done to reach many other parts of the country. Turning his attention on the ANC and the challenges the party has faced, Zuma sad there has been a development of negative tendencies. He said the policy conference would have discuss ways of redirecting the movement, saying party members must also reflect on how the ANC survived many challenges since its inception in 1912. President Jacob Zuma and other members of the ANC leadership were on Friday morning left shocked after the Afrikaans and English parts of the national anthem were left out. Zuma and his deputy, Cyril Ramaphosa, standing next to each other, were seen looking at each other in amusement. There was a bit of silence, with some hoping the choir would proceed with the omitted parts of the anthem, but that never happened. Zuma presented the opening address to the party’s 5th policy conference held in Nasrec, Johannesburg, on Friday morning. President Zuma is expected to deliver the opening address at the conference. Party stalwarts such as Winnie Madikizela-Mandela and Andrew Mlangeni also arrived just after 11am on Friday.